We started off by dowsing our energy levels on a small chart. Most of us were OK , around 50 – 60 – 70 percent, but it was hot, not really a day for being energetic. Then our speaker, Kelly Peacey, invited us all to come and choose a crystal from her table, lead us through a brief meditation as we held them, and asked us to dowse again. There was no denying it, energy levels for most of us had increased! How does that work then? In her fascinating talk on 11th July, Kelly went on to explain that crystals come from the earth and are continually emitting a resonance, a measurable and stable electrical charge by the piezoelectric effect. As an example she reminded us of the old crystal set radios, and how crystals have been used in watches for years. Any given crystal - and there is an infinite variety - is billions of years old and, as part of mother earth, resonates with her energy and is comprised of minerals. We all need minerals in our diet, and Kelly quoted as an example howlite, which can help us feel calm and ease insomnia. But then, howlite contains calcium, which does the same job. Crystals have medicinal properties and, imbued with our intent, bring healing, so do not underestimate them. Holding one during meditation can help slow the brain waves and bring calm. “There’s nothing scientific about choosing a crystal,” said Kelly. “Just pick what appeals to you, you can’t know why.” Frequently the crystal you need will come to you when you need it, often in unexpected ways. We’ve known for a long time that colour affects us is a multitude of ways, and crystals come in all shapes, sizes and colours. A pink crystal attracts unconditional love and understanding; dark blues and purples help us see things more clearly, and improve our intuition. Red gives us vitality and passion; and yellow is associated with confidence and courage. Crystals might only be semi-precious stones, but they have powerful properties and, like people, even the ugly ones have an inner beauty. 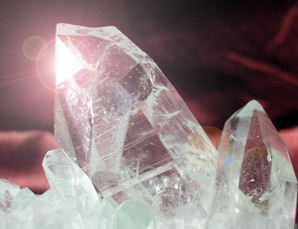 Crystal healing is just part of what the art and skill of dowsing can achieve, which includes water divining, archaeological dowsing and tracking earth energies too. Our next meeting will be on Saturday 27th July when Peter Gibson talks about Earth Energies. All welcome.